How can you represent dependencies in PhpStorm? I'm looking for a way to display all dependencies of a method of a class. Since there is no code example and what you expect to see .... 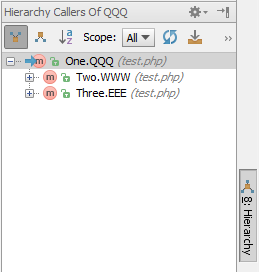 I can only assume that you are after either "Navigate | Call Hierarchy" (then choose proper hierarchy "direction" in Hierarchy tool window) or maybe even "Navigate | Method Hierarchy"
I have a class with a method. I want to check which other classes this method is used? Thank you. If you come to Germany you a free beer.